Yessss! I can officially say it’s Back-to-School season. I have one already back and one on the way to her final year of preschool next week. Truly, before I had kids I never quite understood the back-to-school hoopla moms everywhere celebrated. Let’s just say I get it now. I like to think of it as a celebration of the return of my sanity rather than a celebration of the children being out of the house… It sounds a little more positive. Who am I kidding?! How many snacks I made, fights I broke up over Legos pieces, and complaints I endured I’m really not sure. I lost count at week one. So with that, I send you children off to school to learn something valuable and be perfectly behaved for you teacher, because they always are. Why is that exactly? However, with the return of school means the return of packing school lunches. If your house is anything like mine in the mornings (and my guess is it is), it gets a little chaotic. Trying to get a 4 and 6 year old dressed, fed and out the door while trying to remember all of their forms, homework, library books, etc. is no small feat. Therefore I try to keep my school lunches as simple and sweet as possible. 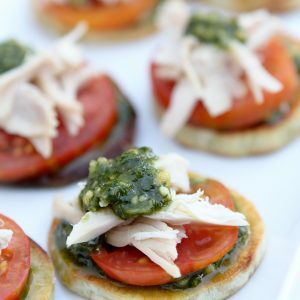 A quick peek onto Pinterest for school lunch inspiration will no doubt fill your computer screen with Frozen sandwich castles, Pokemon meatballs, and a rendition of Van Gough’s the Starry night constructed of kale, celery and squash blossoms. Sooo, that’s not exactly me. Don’t get me wrong, I very much appreciate that others have such creativeness and time management skills at their disposal. It’s just not one of my strengths. With that being said, I DO value putting together a healthy lunch that will fuel my kids through the day and keep them full. I like having things in the fridge prepped and ready to go so that in the mornings I can open it up and drop stuff into their lunch boxes. 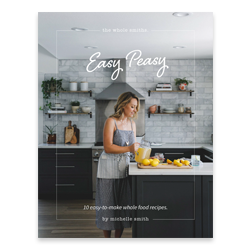 Typically I always include one protein, one fruit, one veggie, something crunchy and starchy, and one or two snacks that are usually dried fruit or nuts. Sometimes I’ll throw in some organic dairy or a snack bar of some sort. And if they’re rreeeallly lucky a little piece of chocolate. 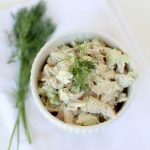 My kids will gobble up chicken or tuna salad so I often make a large batch and use it through the week. 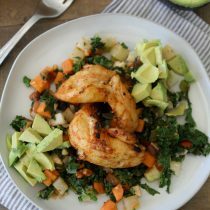 It’s such a great way to get proteins and healthy fats into their little tummies. I recommend using my Whole Smiths’ Whole Roasted Chicken and 30-Second Olive Oil Mayonnaise. 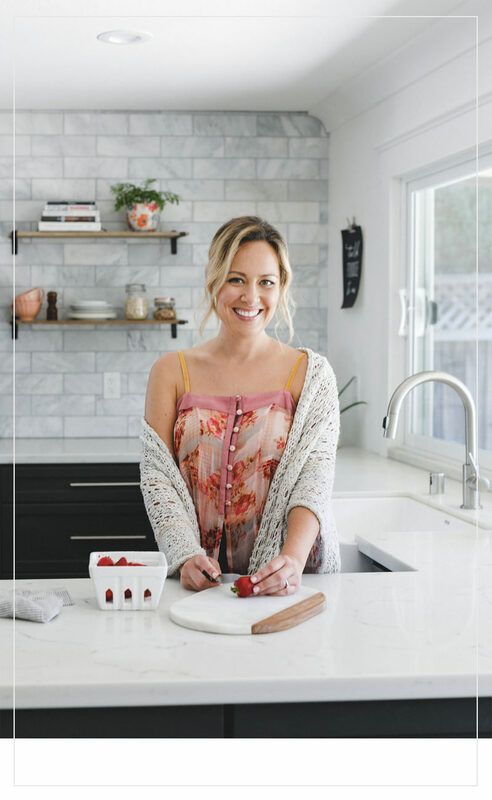 This is the recipe that I use that the kiddos love the most. Personally I like to add some chopped onions, garlic or capers but they always complain about that. So this chicken salad is totally kid AND adult approved which makes it great for work lunches too. 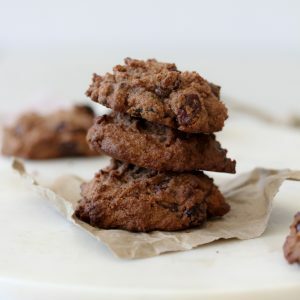 And seriously… save time and make yourself a large batch ahead of time, you will thank yourself. So let’s get to my favorite part, the Simple Mills crackers! First off, I personally love them so much that it’s hard to part with them but as a dutiful mom I do. I cannot state enough how much I ADORE these crackers and how clean they are. You can check out the full list of ingredients right on their website HERE. I feel zero guilt giving them to my kids in their lunches or for snacks. If you look at most commercially produced crackers the ingredient list leaves MUCH to be desired as they are loaded to the brim with additives and unnatural ingredients. Even crackers labeled just as “gluten-free” have a ton of the same junk added to them. I’ve been sending Simple Mills’ crackers off to school with Camryn to eat with her chicken salad all week and she hasn’t complained once. (And trust me, she leaves behind what she doesn’t like in a warm, mushy, pile for me to clean out of her lunch box if she’s unhappy.) In fact, she has devoured them. Tegan, my preschooler, who doesn’t go back until next week, has been enjoying them as well at home. In fact, she’s gotten clever and has started making “cracker sandwiches” by putting some chicken salad between two crackers. I haven’t once had to say, “Eat your lunch please”. 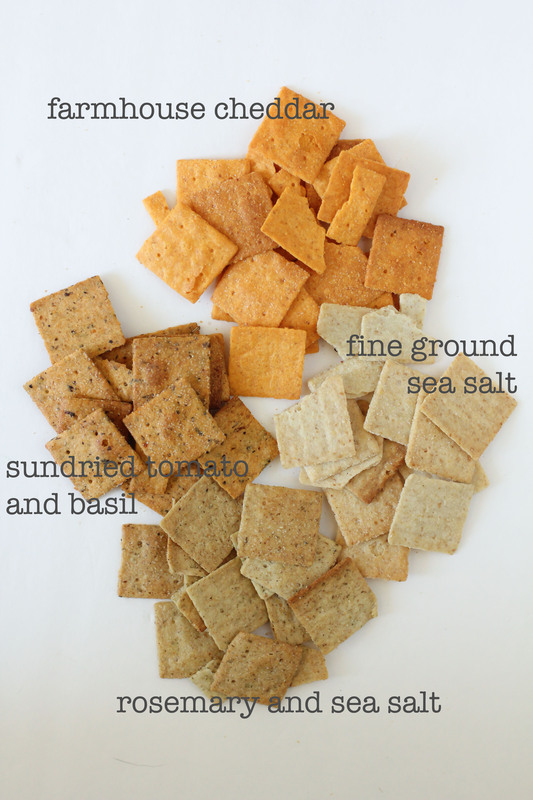 Simple Mills makes four varieties of their crackers, Fine Ground Sea Salt, Farmhouse Cheddar, Rosemary and Sea Salt, and Sun-dried Tomato & Basil. My kids have personally eaten and loved all of them and my husband and I took a box of the Rosemary and Sea Salt with us last month when we went wine tasting. I think it’s safe to say they’re a hit all around. 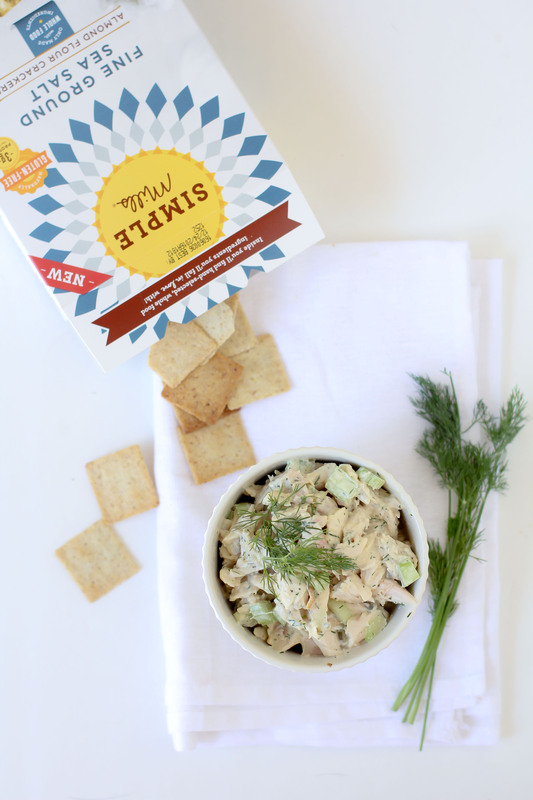 Make sure to check out the Simple Mills’ website and your local Whole Foods to find their products! 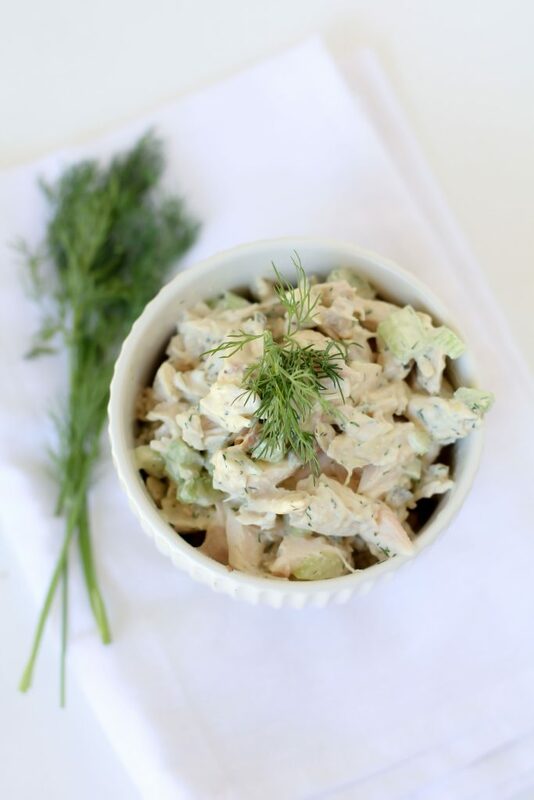 A simple easy-to-make chicken salad that kids and grown ups alike with love. 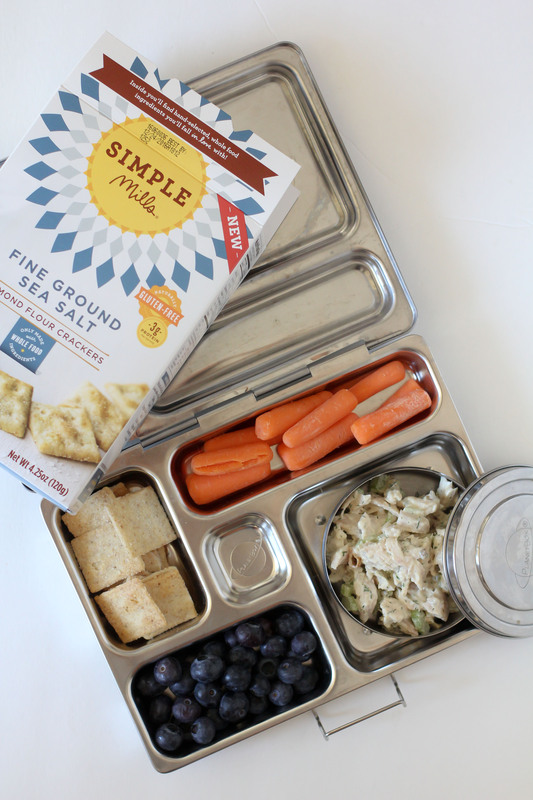 Great for school or work lunches. 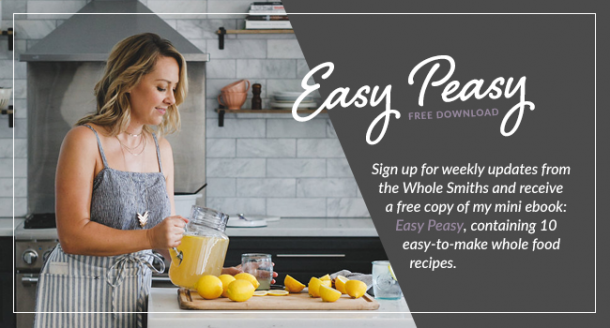 Paleo, gluten-free and Whole30. I found you by way of Lindsay Bakes. Thank you for this recommendation. I’m a major label reader and always interested finding the latest & “cleanest” products. I’ll also check out the Rootz Nutrition protein powder as well.